The sophisticated visual culture of the Kuba kingdom has been noted since the first explorers visited the region. Abstract geometric patterning is deployed across all media, from scarification of the skin to textiles, basketry, pottery, and even the woven walls of noble dwellings. The devices of color alternation, contrast of surface texture, and play of positive and negative space result in seemingly endless variations on lozenge, knot, interlace, and braid patterns. While the Kuba have been admired in the West purely for the inventiveness of their designs, the pervasiveness and complexity of the patterns suggests a meaningful system. In a culture based on oral tradition, symbols, cosmograms, ideographs, and mnemonic devices contribute to the preservation and transmission of cultural knowledge. 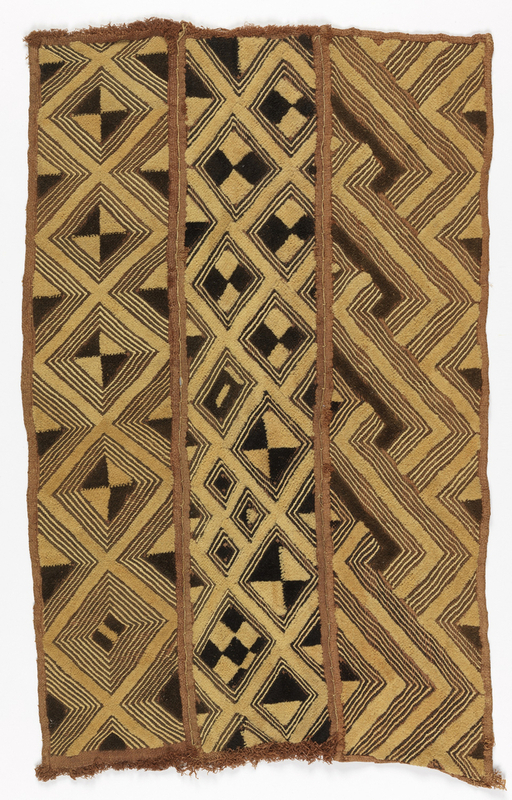 Status cloths are collected throughout a man’s life and are displayed at his funeral as a sign of wealth and stature within the community. Those that have been preserved provide a dazzling display of design versatility and symbolic communication.